Another limited time flash sale at Walgreens Photo, coupon code BOOK75 gets you a 4×6 or 4×4 inch photo book (10 to 25 prints) for $1.75 instead of its regular price of $7. Free store pickup. Shipping is extra (unless they are running a free S&H promotion). Sunday is here and the tax clock is ticking! But this coupon will wait for you after you finish your taxes. Good until Saturday 4/21/18, the latest Walgreens Photo coupons offer 40% off on Posters, Enlargements and Prints with coupon MOMSPICS (Mom’s pics). In addition to the weekly Walgreens Photo coupons headlined by coupon code NOJOKE that gets you 60% off 9×12 inch Wall Calendars, Walgreens has a doorbuster-y limited time coupon, coupon 99CMAGS gets you Framed Photo Magnets for $1 with free store pickup (shipping is extra). These are available in your choice of 4×4 or 4×6 inch size. Same day pickup is available at over 6500 locations. But wait, there’s more! Until Wednesday night on 3/28/18, coupon code EASTERPIX gets you one FREE 8×10 inch enlargement online, with free store pickup as usual. Select the 8×10 print option from the Photo Print options. This coupon expired… The mid-week coupons at Walgreens Photo include an 8×10 inch enlargement going for $1 with free store pickup using coupon code 99CENLARGE in the shopping cart. If you prefer shipment to your address of choice, shipping is extra (unless they have a free S&H promotion). A new week is here bringing with it new Walgreens Photo coupons, headlined by coupon code WINTERSAVING that gets you 50% off “Everything Photo” (all the various photo print options they have) until Wednesday at 11:59pm central time. The usual terms apply, up to five coupon uses per customer during the promotional period, with free store pickup. Shipping is additional (unless they have free shipping promotions). Added to the Walgreens Photo coupons is another coupon that ends tonight (Saturday at 11:59pm central time). Coupon DIYBOOK gets you 50% off custom photo books from Walgreens Photo. Free store pickup. Shipping is extra unless they are running free shipping promotions. In addition to the previously mentioned coupons, there is also a limited time freebie from Walgreens Photo. Use coupon code VDAYFREE to receive a FREE 8×10 inch photo print. Shipping is $0.99 OR you can select FREE store pickup if you are near a Walgreens B&M store! It’s the holiday spirit at Walgreens Photo, for a limited time, coupon code GIFT2U gets you a free 8×10 inch photo print with free store pickup. Delivery to an address of your choice is not free unless they have free shipping promotions. This is a limited time offer. Walgreens Photo is spotlighting their 11×14″ Metal Panels as they are offering them for $14 each with coupon code METAL65. The regular price is $40. As the coupon name suggests, it is a 65% off discount! Free store pickup. If you prefer shipping to an address of your choice, S&H is extra (unless they are running free shipping promotions). Good until Saturday night (12/16/17) at 11:59pm central time, coupon code SANTA60 gets you 60% off Wood Panels and Custom Floating Picture Frames at Walgreens Photo. I’m posting them separately since they have different expiration dates. Good until Tuesday 11:59pm central time, coupon code WRAPITUP gets you 50% off Everything Photo at Walgreens Photo. “Everything Photo” is all their related photo print options, custom photo books, prints, calendars, coffee mugs, etc. Also ending on Tuesday night, coupon code PRNT35EM gets you 35% off photo prints at AdoramaPIX. Meanwhile coupon code MYCANVAS gets you 50% off custom canvas prints until Saturday 12/9/17 at 11:59pm central time. This expired: Walgreens Photo (online and app only) is offering 50% off Everything Photo (all the various photo print offerings they have) with coupon code ELFPICS entered at checkout by Wednesday at 11:59pm Central time. Coupon time at Walgreens Photo. Coupon code WINTER75 gets you 75% off custom Photo Books until Saturday 11:59pm. Free store pickup. Shipping is extra unless they have free shipping promotions. Coupon valid for up to 5 separate uses. The discount covers the first twenty pages of each custom photo books. Additional pages are at full price. This is a YMMV promotion as Walgreens Photo is sending coupons with single use coupons for each email subscriber. If you have received the email of this promotion, you can get 25 4×6 inch photo prints for $0.01 each. So $0.25 for 25 prints. Free store pickup at your local Walgreens B&M store. If you prefer to mail it to an address of your choice, shipping is extra unless there are free shipping promotion. The coupons expire Saturday 9/30/17. Walgreens is launching their new shopping week with a barrage of Walgreens Photo coupons. You can get 50% off on Photo Cards, 40% off on Canvas prints, or $10 off orders of $20+ in general photo orders or Drinkware or “Pillows & Blankets”. You can see all six coupons along with detailed terms and conditions over there. The photo cards coupon expires Saturday 11:59pm central. 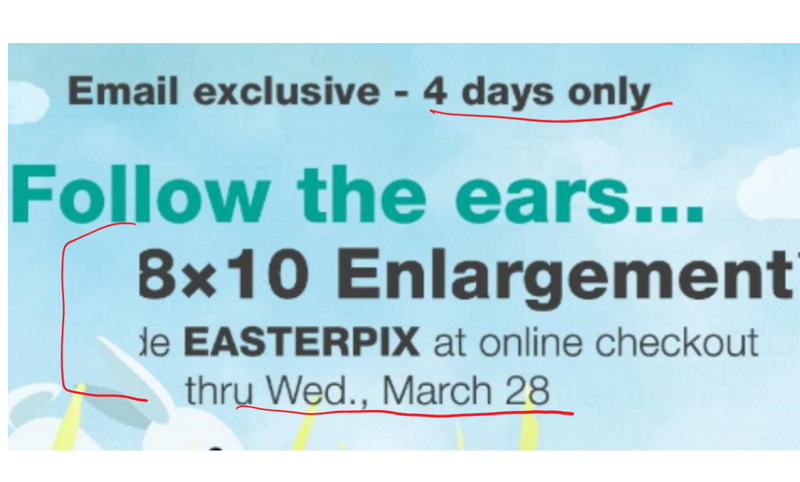 The rest expire Wednesday 11:59pm Central (unless they get extended to Saturday night). Limit up to five uses per coupon per customer. Free store pickup. Shipping to your address of choice costs more. This offer expired… Good until Saturday night at 11:59pm Central time, coupon code 99CLARGER can get you 8×10 inch prints at Walgreens Photo for 99c each. Limit up to five uses per customer. Free store pickup. Shipping is extra. You can use the coupon online or with their app but not in-store. But you can pick up the order in-store. A new coupon is up and running at the recently remodeled Walgreens Photo website. Coupon code SPRING4PICS gets you 40% off on Everything Photo related they carry until 11:59pm central on 3/4/17 [extended until Sat PM]. The usual restrictions apply. And now a mini round-up of print-related coupons. At Walgreens Photo, coupon code CELEBRATE50 gets you 50% off everything photo-related offered by their Walgreens Photo print services (the benefit of this being the week after Valentine’s). The coupon ends on Wednesday at 11:59pm central time, but sometimes the coupons get extended to Saturday night (but not always). Next up, at Adorama PIX, coupon code PXHUDSON40 gets you 40% off Hudson Heirloom Albums. Cannot be combined with other offers. Free shipping with post-coupon order totals of $49+. Coupon expires 2/26/17 at 11:59pm. Reading is fun-da-mental, and so is printing! Coupon code GETITALL gets you 40% off on Everything Photo (all the various photo print options they offer) at Walgreens Photo. Free store pickup. Delivery to your address of choice costs extra (unless they have online S&H promotions). Limit five uses per customer. Offer ends on Wednesday at 11:59pm Central time but sometimes these coupons get extended to Saturday at 11:59pm Central time. A new shopping week is here and Walgreens Photo has a new coupon, code PHOTODEAL50 gets you 50% on “Everything Photo” which covers most of the photo-related print offers they have. The usual terms apply, The coupon expires on Wednesday 12/7/16 at 11:59pm Central (unless it gets extended to Saturday same time – sometimes they get extended, sometimes they don’t). It’s coupon time again at Walgreens Photo where coupon code GIVETHANKS50 gets you 50% off “Everything Photo”, a blanket category that includes most of their custom photo print related offerings, including …blankets 🙂 The coupon ends on Tuesday 11/22/16 Wednesday 11/23/16 [CORRECTED] at 11:59pm Central (unless it gets extended until Saturday night). This mid-week coupon expired… The mid-week coupon from Walgreens Photo has arrived, and it is a 75% off on Framed Photo Magnets when you enter coupon code MAGNETDEAL until 11:59pm central time on Saturday November 12 in 2016. The usual terms apply (up to five uses per customer, free pickup at a Walgreens store, etc). A new week is upon us and so are the new coupons at Walgreens Photo. Coupon code code NOVGREETING gets you 40% off Photo Cards, while coupon code TREEDECOR gets you 40% off Photo Ornaments. Meanwhile coupon code 25GIFTSNOV gets you 25% off Photo Gifts. The usual coupon terms apply, limit up to five users, free store pickup (where possible/available), etc, etc, etc. The coupon expires Saturday 11/12/16 at 11:59pm central time. A new week is upon us and so is a new coupon at Walgreens Photo, coupon code HALFOFFDEAL at checkout thru Wednesday November 2 at 11:59pm Central time gets you 50% off all the various photo print options they have (custom photo books, actual prints, metal, wood, mugs, phone cases, calendars, holiday cards, etc). The usual terms apply, limit up to five uses per customer, free store pickup, otherwise you may have to pay S&H (unless they have any free S&H promotions on their website). Sometimes the coupons get extended to Saturday 11:59pm Central time, but that’s not guaranteed until it happens.